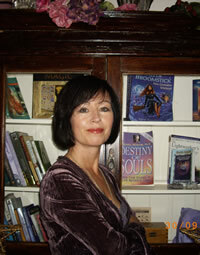 I am an experienced Tarot Consultant, Tarot Teacher and Tarot Writer. I have written an in-depth and comprehensive online course for those who wish to become Professional Tarot Readers/Consultants. I am also skilled in various areas of Digital Technology and Website Development. I make vintage-style boudoir dolls in my spare time and am a trained mezzo soprano. I have a passion for Tudor History. Story-telling with tarot. Using the Suit of Wands for inspiration, follow the journey of the young X-Factor Hopeful – The Page, as he embarks on a journey in search of fame and success. Tarot Talkies – In Trouble With The Missus! Alcohol Archetypes of The Major Arcana. A thought-provoking exploration of how each card might relate to alcohol both in a positive and negative manner. Exercise in making connections and linking Empress With The Suit of Pentacles when they appear together in a reading. Keyword for Empress in this exercise is ‘Woman’ With each card in the Suit of Pentacles referring back to it.